As the jet black oil pours into my glass a very thick, dark tan head rises and few inches and sticks around for a while. The head resides after a few minutes of drinking and leaves minimal lace (I'm starting to suspect that it is this glass and not the beer that isn't conducive to lace for some reason...anyone else experience this?). The smell is intensely of caramel, chocolate, coffee, burnt malt, dark fruits, and alcohol. The taste is complex...burnt dark chocolate and strong coffee, roasted malts, cherries, prunes, figs, and other dark fruits...this is incredible. This beer overloads your senses in the best way possible...it is not as complex as some other imperial stouts/ Russian Imperial Stouts but it hits you harder than the others...and that is what makes this beer incredible. 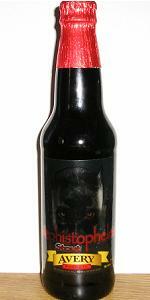 It has a very full body with a creamy texture that is complimented nicely by the mild carbonation. Towards the finish, the alcohol burn really kicks in, which is usually not one of my favorite things but in this case, it is so well balanced with all the other sweet flavors that it works magnificently. Oh man, this beer is awesome...I think the 16% ABV slowly took effect on my during my review, haha.